Linköping is a city of busy squares with trade and room for social interaction. Elin Magnusson brings up the issue how the public space has been used throughout history and how contemporary tendencies challenge the democratic freedoms. The work consists of a pulpit that anyone is free to use. On the podium the person who wants to speak their mind encounters a quote by the Swedish writer Moa Martinson. Opposite stands an object which resembles the aesthetics of the podium but is reminiscent of a watchtower. Unlike the pulpit, visitors can’t enter it, making the guarding position anonymous and hidden. 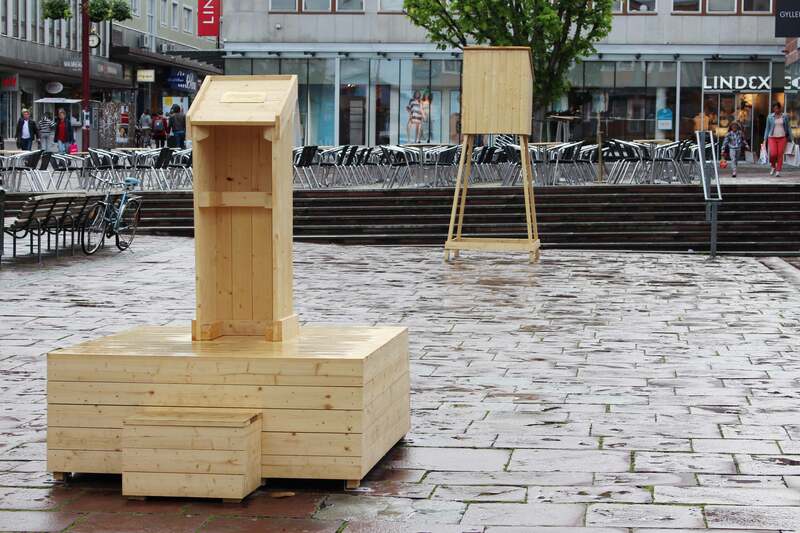 The work is part of the group exhibition Becoming by Recalling, which takes place in several locations in Linköping and is initiated by Passagen Konsthall. It raises questions about cultural heritage and identity through the works of 12 artists from the Nordic countries and Ukraine.